Choosing the right attorney is the most important decision you will make about your case. Any attorney can purchase a web site and claim that he or she is aggressive. He can also rent a billboard, take a picture of himself rolling up his sleeve, and claim that he is a fighter. Reality, not wishful thinkers or self obsessed want to be fighters is what matters. With more than thirty years of court room trial experience Joe East has developed the reputation among his peers and the community of being an aggressive, hard nose, and adept attorney. He is the real thing. However, he also has the experience and temperament to realize that in some cases a less aggressive approach is in the best interests of his clients. Joe East graduated from the Walter F. George School of Law, Mercer University, Macon, Georgia in 1986 where he was on the school's Law Review. He is a member of the Georgia Bar Association, Criminal and Family Law sections of the Georgia Bar Association, and Camden County Bar Association. He is also a member of the Camden County Criminal Justice Council. 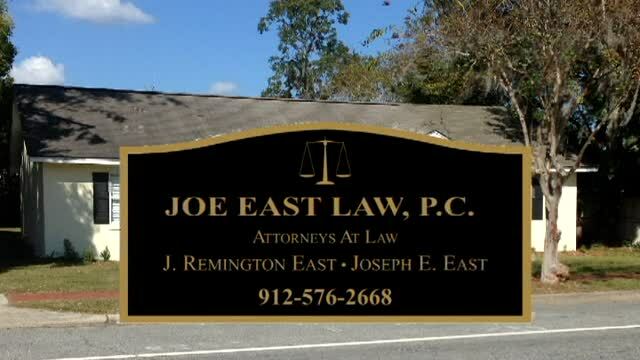 J. Remington East is also a member of the firm. Remington graduated from Coastal School of Law, Jacksonville Florida in 2016 where he was sixth in his class and on the school's Law Review. He is a member of the Georgia Bar Association. He is also the current President of the Camden County Bar Association. Counties: Brantley, Camden, Charlton, Glynn, Pierce, and Ware. Cities: Blackshear, Brunswick, Folkston, Homeland, Jesup, Kingsland, Nahunta, Saint George, Saint Marys, Waycross, Woodbine. The information contained in this Website is provided for informational purposes only, and should not be construed as legal advice on any subject matter nor the formation of a lawyer/client relationship.